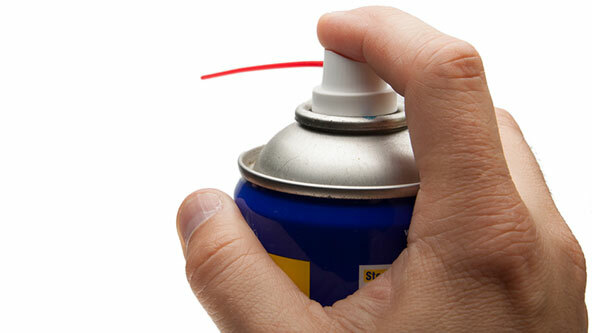 Multipurpose lubricant spray can cause irritation if inhaled or if skin or eye contact occurs. It can be harmful or fatal if ingested. Inhalation of vapors can cause headache, fatigue, dizziness, and nausea. Repeated skin contact may lead to skin dryness or cracking. Eye contact can result in sharp pain and irritation in the eyes. If ingested, it may cause gastrointestinal irritation, nausea, vomiting and diarrhea. Ingestion of multipurpose lubricant spray is also an aspiration hazard and, if it enters the lungs, it can cause severe lung damage and even death. There has been no evidence of carcinogenic properties or long-term adverse health effects associated with the proper use of multipurpose lubricant oil spray. Inhalation—Immediately move the exposed person to fresh air and get prompt medical attention. Eye Contact—Remove contact lenses if wearing. Immediately flush eyes with plenty of water while lifting the eyelids and continue doing so for at least 15 minutes. Seek medical attention if any discomfort continues. Skin Contact—Remove contaminated clothing immediately and wash skin with soap and water. Get medical attention if symptoms occur after washing. Ingestion—Do NOT induce vomiting. Never give anything by mouth to an unconscious person. Seek medical attention immediately. Aerosol cans of multipurpose lubricant spray are flammable and must be kept away from heat, sparks, open flames, and all other sources of ignition. Store in a cool, well-ventilated area, away from incompatible materials. Do not store above 120°F or in direct sunlight. When disposing of multipurpose lubricant spray waste and residues, do so in accordance with federal, state, and local environmental regulations. Ensure containers are empty prior to discarding, to prevent risk of explosion. The steps and information presented above are general guidelines. For exact safety information and emergency response procedures, review the supplier-specific safety data sheet for any product or chemical you use. Search MSDSonline.com for safety data sheets on multipurpose lubricant spray.